While most GIS datasets have some form of street network as part of their landbase, this data generally does not contain enough information to provide turn-by-turn directions for getting from one location to another on a map. For example, let’s look at TIGER data which is freely available from the US Census Bureau. While this data does provide street information containing street segments with address ranges, it does not capture the intricacies of the street topology (how the streets are connected together). One way streets, overpasses, and underpasses are just a few of the factors complicating the process of knowing which routes are possible to travel when going from one location to another. 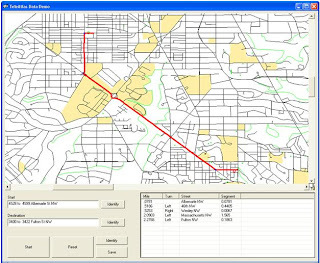 More sophisticated street network data is required to perform useful point to point street routing, and while many GIS datasets do not have this quality of street data now, it can be purchased (Tele Atlas’ Dynamap Transportation for example) or available from other parts of the business that may be using the street network data for other applications. GTI has provided GT/Trace for several years as a tool to simplify the process of tracing electric, gas, water, fiber, and telephone networks. GT/Trace abstracts the commonalities found in all of these network traces and encapsulates the functionality in a well tested, optimized component that greatly speeds and simplifies the implementation of tracing applications. However, tracing street networks is slightly different than tracing a facility network. You may still be traversing from point A to point B, but the rules governing the traces are somewhat different and the size of a street network can be significantly larger than a facility network. GT/Trace has been enhanced to provide additional functionality specifically suited to street networks. The ability to quickly perform a cost based (shortest distance or shortest time traveled) search of a very large network has been added while still maintaining the standardized approach to network tracing that GT/Trace already provided. GTViewer and GTVx can both take advantage of the new functionality in GT/Trace and provide Point to Point Street Routing functionality if your street network data meets the requirements necessary to support it. Previously, we have recommended our MapPoint integration with GTViewer to accomplish this task, but as more and more of our customers are acquiring high quality street network data, it is natural for the routing to be done within GTViewer or GTVx. Version 7.0.x.25 of GTViewer is available. - NEW - GTV #1010 - GTField Post will now support a %DATE% token for the current date and time. - FIX - GTV #1011 - QueryInitialize with Thematic Query would not accept blank prompts as wildcard values, so a new Data Propety has been added called ThematicQueryBlank flag. If set to 1 (default is 0), then any blanks in the prompt query will now be accepted. The QueryFetchRecords has also been updated to return the record values (before it only need to return the prompts since it was an exact match). - CHG - GTV #1012 - Symbol Fonts are no longer filtered by usage for extract files. - CHG - GTV #1013 - Extract file no longer filter colors by usage for the extract files. - NEW - GTV #1014 - Fit Session Graphics toolbar button has been added to the toolbar. - NEW - GTV #1015 - XML has been added to the GTField Update formats. - FIX - GTV #1016 - XML export was not correctly converting special characters in text strings to the appropriate XML syntax. Version 7.0.x.16 of GTVx is available. - FIX - GTVX #1011 - QueryInitialize with Thematic Query would not accept blank prompts as wildcard values, so a new Data Propety has been added called ThematicQueryBlank flag. If set to 1 (default is 0), then any blanks in the prompt query will now be accepted. The QueryFetchRecords has also been updated to return the record values (before it only need to return the prompts since it was an exact match). - CHG - GTVX #1012 - Symbol Fonts are no longer filtered by usage for extract files. - CHG - GTVX #1013 - Extract file no longer filter colors by usage for the extract files. For more than two years, GTData has provided two utilities for performing incremental updates to GTViewer data: GTUpdateData and GTUpdateGtg. These utilities integrate graphic and tabular changes into a GTViewer dataset. While these utilities can be used to provide a substantial reduction in the time required to update a GTViewer dataset and in the amount of data that must be distributed to the clients, they are just two pieces of a much bigger puzzle. GTI is currently testing its second generation Increment Update Solution. While the end result is the same, this new approach provides a much more sophisticated set of tools and further reduces the client-side processing required to apply an incremental update . While the Update Manager is not required to perform an incremental update, it streamlines the process and provides assurances that update files are properly created, and that a client cannot accidentally skip intermediate updates which would likely corrupt their local dataset. 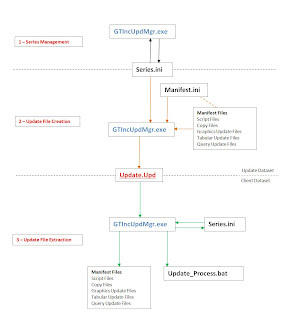 The Update Manager also orchestrates the process of applying all of the different update components to the appropriate GTViewer data (graphics, linkage, tabular, and query). The Update manager uses the rest of the new utilities to perform its job: GTUpdateGtg1, GTUpdateData, GTQuery, GTDelQueryRec, and GTAppendQuery. The original GTUpdateGtg utility has been replaced with the new GTUpdateGtg1 which not only applies a graphics update to a GTViewer graphics file (.gtg) but also to the Spatial Index file (.gtn) and Linkage File (.key). Simultaneously updating the graphics, index, and linkage files prevents the client from having to regenerate the spatial index and linkage files from an updated graphics file which saves a considerable amount of time and processing on the client. The GTUpdateData utility has been enhanced to update not only the GTViewer tabular file (data.txt), but also the tabular index file (.idx). The client no longer has to regenerate the tabular index file from an updated tabular data file. The GTUpdateData utility also creates some temporary files used to accelerate the Query update process. The GTQuery utility has been updated to more easily generate incremental query files from the Incremental tabular files used by GTUpdateData. These incremental query files are then integrated into the existing query files (.qry) with the GTDelQueryRec and GTAppendQuery utilities. Updating a query file is significantly faster than regenerating a query especially if only a fraction of the records used by the query have changed since the last update. The previous incarnation of the Incremental Update utilities required that each query be regenerated from the updated tabular data file which could take some time to complete on the client. While all of these additional utilities and steps may seem to complicate the incremental update process, this second generation of the Incremental Update Process is actually much simpler to implement and use because the Update Manager handles all of the details. Incremental Updates may not be for everyone, but if your GIS can support the creation of the incremental update files (by knowing which features have changed since the last update), then the next generation of the Incremental Update Solution maybe an option for you. Version 7.0.x.29 of the GTViewer .NET Control is available. - FIX - #161 - Reviewing a feature while drawing a line would cause a problem if no points were already drawn. - FIX - #162 - Fillable element using the Border Color style property were not not inverting their color when drawn on the same color background. - NEW - #166 - ColorTable Property Added. Version 7.0.x.15 of GTVx is available. - FIX - GTVX #1002 - Feature Tooltip was not being cancelled after a session graphics element has been started. - FIX - GTVX #1001 - The ReQuery button in the Query Results would only repopulate the first 3 prompts for regular queries (Thematics Queries were not being supported). Now, Thematic Queries and any number of prompts are supported. - NEW - GTVX #1003 - Feature Tooltip now allows an =, :, or - to be placed after the attribute label. If no separator is provided, the default = will be used. - FIX - GTVX #1005 - Fillable elements were not inverting the element color when drawn on a background of the same color if the border color style were used. Version 7.0.x.24 of GTViewer is available. - NEW - GTV #1006 - GTField Post Functionality. - NEW - GTV #1007 - The UseShortNameForFeatureCounting entry has been added to the Additional Properties Section so that you can use just the Filter Name in the Feature Count dialog instead of the Category Name - Filter Name. - NEW - GTV #1008 - FeatureToolTipMaximum Threshold added to Additional Properties and to Get and Set DataProperties.